A central hypothesis in Bodynamic Analysis concerns the time period in which individual muscles come under voluntary control. There is observed to be a critical time period in which they acquire an imprint. This imprint is not simply about physical strength or kinesthetic ability. It concerns the psychological content or issue associated with the activity or function of this muscle. Thus the muscle encodes or "remembers" what happened in the emotional/ psychological environment in the time period in which it came under conscious control. 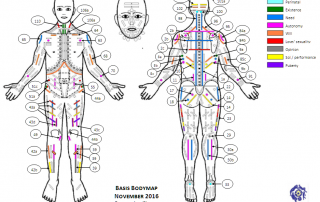 In this article we introduce readers to the Bodymap, a precise diagnostic tool developed as a part of Bodynamic Analysis. The Bodymap is a concise visual format for displaying and analyzing psychological information stored in the muscles. The ability to measure muscle responses and access the historical information they contain makes a developmental analysis in terms of psychological character structures more concrete and less metaphorical. We also introduce ten “Ego Functions” (e.g. grounding and reality testing, centering, etc.) that are used to understand human functioning. 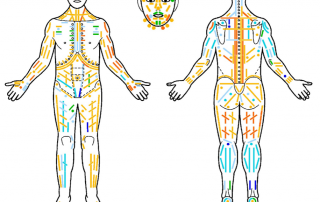 In Bodynamic Analysis, we use a Bodymap as a starting point for the evaluation of the personality of the client. It also helps us find out how they might benefit from different kinds of therapy. 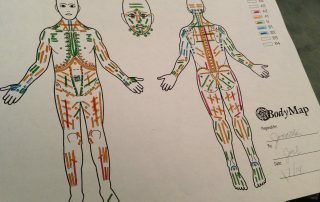 On the Bodymap form, which is a drawing of a figure of the human front and backsides, we make a color-coded depiction of the muscle responses of almost all the muscles of the client. By muscle response, we mean the elasticity of each muscle, as measured by palpation. We differentiate nine degrees of response: 4 degrees of hypo-response, 4 degrees of hyper-response, and 1 neutral response.